Sign up for Broadjam today to follow Shadows of the Vague, and be notified when they upload new stuff or update their news! 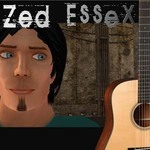 Zed Essex and the Avatars are a Second Life Recording group. Their first studio album is currently in production. This is a series of songs written from the perspective of a computer that has become self aware. The songs are an attempt by the computer to communicate with it's user. The idea is that a computer falls in love with it's operator. The operator finds himself a girlfriend and so now the computer feels left out!